The #1 bestselling international phenomenon that asks, If you won the lottery, would you trade your life for the life of your dreams? Jocelyne lives in a small town in France where she runs a fabric shop, has been married to the same man for twenty-one years, and has raised two children. She is beginning to wonder what happened to all those dreams she had when she was seventeen. Could her life have been different? Then she wins the lottery—and suddenly finds the world at her fingertips. But she chooses not to tell anyone, not even her husband—not just yet. Without cashing the check, she begins to make a list of all the things she could do with the money. But does Jocelyne really want her life to change? Grégoire Delacourt was born in Valenciennes, France, in 1960. His first novel, L'Ecrivain de la Famille, was published in 2011 and won five literary prizes. 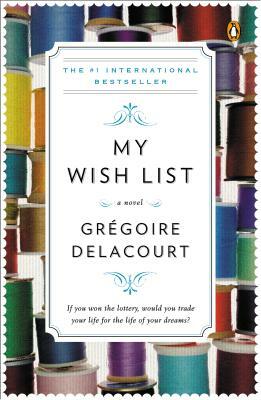 My Wish List was a runaway number-one bestseller in France; publication rights have been sold in more than twenty-five countries. Delacourt lives in Paris, where he runs an advertising agency with his wife.